JULY 2-8, 2014 UCW 13 WWW.UPANDCOMINGWEEKLY.COM Visiting the exhibit titled Crossing the Bridge by local artist Aaron Wallace is anything but local. Hosted by Up and Coming Weekly, at Gallery 208, Wallace is an artist whose paintings take us into the postmodern landscape of material, creativity and talent — his work is the bridge for us to cross into the 21st century possibilities of fine art. For visitors to the opening reception, or the exhibition later, and for those who regularly visit galleries, when is the last time you met a young area artist who questions what a painting can be within the context of the history of American painting? Wallace ponders the question and gives us his answers with this recent body of work. While looking at many of the nonobjective abstract paintings, visitors may ponder his intent. What are we looking at? There is an absence of descriptive and decorative subjects; instead you are seeing a painting morphing into a relief sculpture. For me, the painting is visually communicating something like this: "Look at me, I'm not what you think I should be, am I not exquisitely beautiful?" (Known as the "pillow painting" series, these works speak to the possibility of a painting to transcend what we traditionally think a painting should be.) Wallace will tell you, for him as an artist, the school of Abstract Expressionism has been influential conceptually and stylistically. In his work I can see how three or four generations later, the lineage of 20th century abstraction still influences our way of making images: (1) letting material determine the direction of the image; (2) rich and complex surfaces evoke a type of space or ordering of light within the painting; (3) and, according to Kirk Varnedoe, "the idea that destroying order is the same as producing it." All of the above are evident in Wallace's work — certainly process driven. In addition, Wallace's approach is to combine the creative use of stains, drips and smears in combination with stencils — the painterly is juxtaposed with the hard edge and overspray of pop art and graffiti. Using found objects to create patterns, Wallace also uses printmaking techniques to create textures in a transfer process. Textured surfaces, like bubble wrap, are inked then the pattern transferred to his painting surface in relief printing fashion. Wallace will tell you the intent is for each work to become an "art object" and he has been focusing on several themes. The grid format is a "reoccurring motif " within the work. He attributes the grid to having been influenced by his father and spoke proudly that his father was a "master craftsman who has laid tile as a profession for more than 40 years." Protuberances (actual bumpiness on his surfaces) and amoeba-like, segmented shapes sprawl across surfaces — both are reoccurring motifs in the exhibit, which lend themselves to the artist's love of nature as well as reflecting his sense of humor and the whimsical. An avid camper and employed at ZipQuest, Wallace sees his love of nature as inspirational. In addition to his love of nature, Wallace talked about other significant influences on becoming an artist. He stated, "Being a combat veteran has influenced my politics, but that footprint, even though it is there, is less obvious in my work. Even middle-school art classes made an impact on my love of the arts, as well as studying art at Fayetteville Technical Community College and Fayetteville State University. A big influence has been Greg Hathaway since he taught me so much about the medium of clay and techniques for working in clay." In short, Wallace uses a combination of mediums and techniques to create a style of painting that is energetic and personal, spontaneous and controlled, flat and luminous. The luminous surfaces in some of his paintings are transmitted through transparencies or heightened cool and warm contrasts, contrasts of value and saturation. In many of the paintings, rhythm and movement is evoked through the repetition of color, shapes and lines. Interlocking patterns also produce a color rhythm in his prints and paintings. In the "pillow paintings" paint is built up into thick impasto and seems glue- like, affixing itself to the surface so that the sheer weight of color becomes the materiality of color! As a young artist, Wallace has already participated in a significant project and has participated in national and regional invitational exhibitions. In 2010, he was selected as one of seven artists who worked on the North Carolina Veteran's Park project in which each artist went into the counties across North Carolina and cast the hands of veterans in wax for the Wall of Oath (all wax casts were then cast in bronze). He cast the hands of veterans and supporters of veterans for the relief sculptures in concrete on the columns in the section of the park known as the Community Plaza. In 2012, Wallace was invited to participate in a regional invitational titled Screened: Printmakers of North Carolina at the Durham Arts Council in North Carolina. Then in 2013, he was invited to participate in an international invitational titled Contemporary Ideas in Art at the Rosenthal Gallery on the campus of Fayetteville State University. His prints were exhibited regularly at Gallery 311 in Raleigh, North Carolina before the gallery's recent closing. 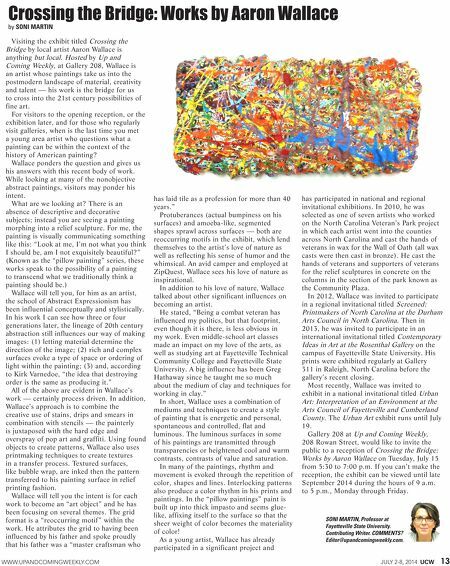 Most recently, Wallace was invited to exhibit in a national invitational titled Urban Art: Interpretation of an Environment at the Arts Council of Fayetteville and Cumberland County. The Urban Art exhibit runs until July 19. Gallery 208 at Up and Coming Weekly, 208 Rowan Street, would like to invite the public to a reception of Crossing the Bridge: Works by Aaron Wallace on Tuesday, July 15 from 5:30 to 7:00 p.m. If you can't make the reception, the exhibit can be viewed until late September 2014 during the hours of 9 a.m. to 5 p.m., Monday through Friday. Crossing the Bridge: Works by Aaron Wallace by SONI MARTIN SONI MARTIN, Professor at Fayetteville State University. Contributing Writer. COMMENTS? 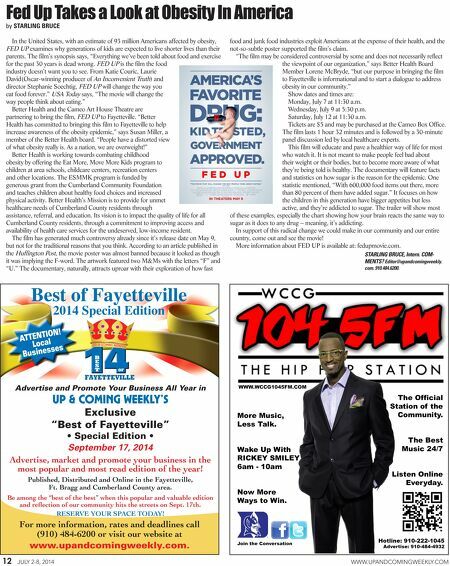 Editor@upandcomingweekly.com.